Cloud Imperium, or Roberts Space Industries, has released a little treatise on what to expect from the FPS mode in Star Citizen. In their article they detail each stance that will be available, the effect of breathing on your character and they show off an early HUD design. 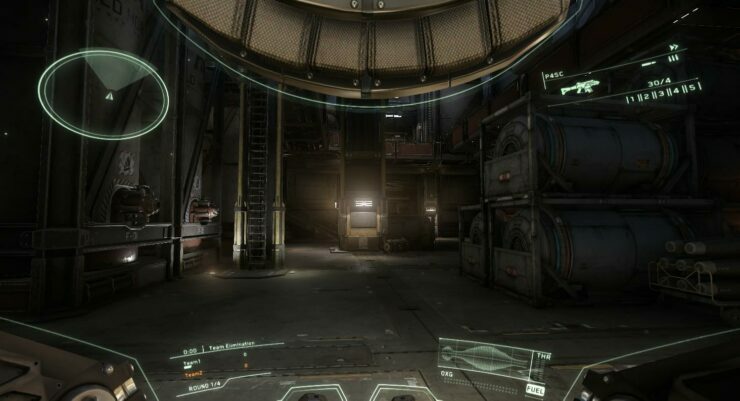 The FPS module of Star Citizen will feature incredibly well thought out and implemented game mechanics. The FPS module is going to be just as well designed as the flight simulator portion of the game. They’ve thought of a lot of different ways to implement a proper FPS experience. Their goal is to add a mechanics that reflect the real world while still maintaining a great game, emphasis on game. Also, the module might be called Star Marine, or perhaps that’s their own internal project to test all of the features. 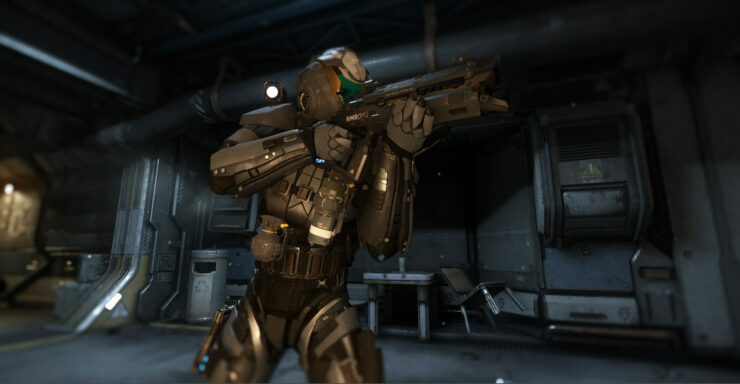 The team is on the lookout for more ways to make Star Marine’s first-person shooter simulation realistic and challenging. Going forward, we’re looking into how we can apply this same system to melee combat and brawling. With breathing and stamina as balance points, we believe we can make for something a little more interesting than the traditional ‘press space to punch’ melee option. Animation speed, damage amount and more can be tied to the breathing and stamina subsystems, making for melee combat that’s more like a real fight. You’ll have three different stances related to your weapon that you can choose from as opposed to the usual two in FPS’s. The lowered stance is where your weapon is, well, lowered and you can move quickly. 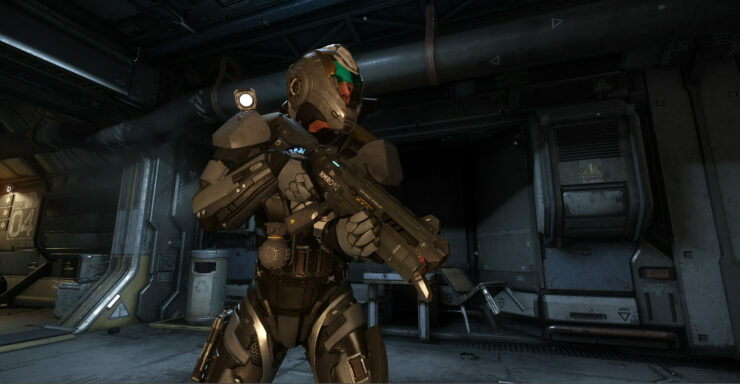 The ready stance is when your weapon is placed against your shoulder but you aren’t actively focusing down the sights, and lastly is what they call the ADS, or Aim Down Sights, stance. This is where you move far slower and you’re concentrating actively down the sights. 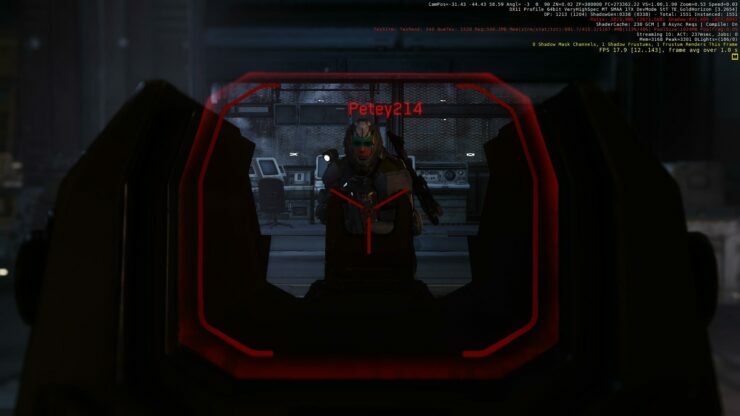 Each stance will have contextual actions and a contextual HUD, which they revealed. Now breathing is usually just an effect in game, something designed to let you know when your stamina is low. It’s usually not a true integrated mechanic. But Star Citizen wouldn’t be complete without a completely modeled breathing system that affects your performance. Here’s the breakdown of breathing in Star Citizen, straight from their site. Holding your breath is the active part of the breath system. By holding a button, you will hold your breath for a specific amount of time before your character releases the breath for you. The longer you hold your breath, the lower your stamina gets. If you have little to no stamina, then you will not be able to hold your breath very long. I hope they’re able to integrate their dream into something that feels natural. I think that FPS’s go the route that they do because of simplicity and the fact that it’s a game. Even those that are more realistic, such as Arma, there is only so much you can do with a keyboard and mouse without making it feel clunky. Roberts Space Industries does state that these are automatic actions brought about by seemingly natural movements; aiming brings you to the ADS stance and pressing the fire button will bring you to the ready. Time will tell just how smooth and well integrated these are.